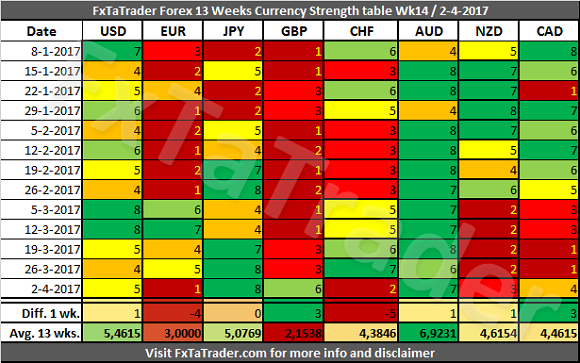 In the Currency Strength table, the JPY was again the strongest currency while the EUR was the weakest. There were some significant changes last week with the GBP and the CAD gaining 3 points. The CHF lost 5 points and the EUR 4. The other currencies remained around the same level with a maximum difference of just 1 point.. 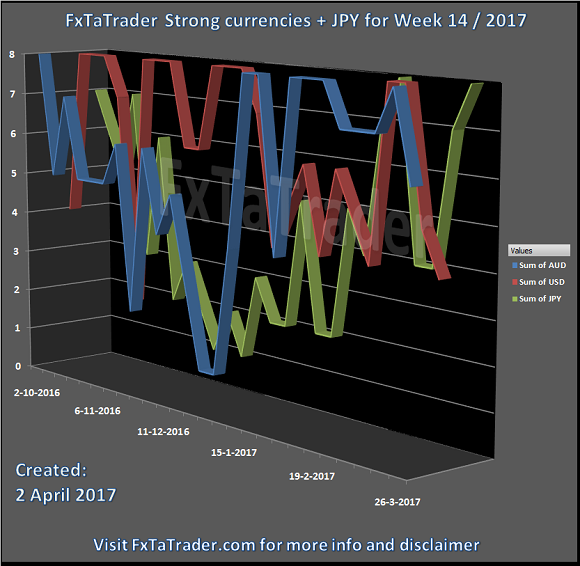 The JPY is gaining a lot of strength lately and is having scores within the range of the strong currencies during the last 3 weeks. As can be seen the Average 13 wks. Score of the JPY is very close to the USD which is a strong currency. The AUD is having a lot of strength lately while the USD is showing some signs of weakness. During the last 3 weeks it did not have scores within the range of the strong currencies. The JPY is gaining a lot of strength lately. 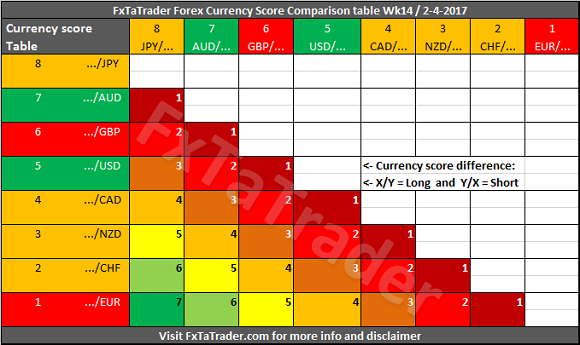 During the last 7 weeks it had 5 times a score of 7 or higher, being within the range of the strong currencies. It had a temporary dip to a score of 4 but recovered fast and strong. As can be seen in the chart here below, the JPY had clearly a structural path to the bottom showing lower highs and lower lows. The bottom was reached in December last year. After that it started a structural path to the top showing higher lows and higher highs. There are many ways to follow the rate changes during the week. This can be done e.g. by looking at the charts of course and checking e.g. the Ichimoku and/or MACD in the Daily and 4 Hours chart. There are also many tools, apps and websites where the development of rates of currencies is shown in different automated ways. This may be by pips or percentage difference or by comparing the values of indicators like the RSI, Moving Averages, MACD, Ichimoku etc. On my blog is a Heatmap available that can be of use also.